Traditional workout jump ropes might as well be preschool playground toys as far as crossfitters are concerned. These conventional, run-of-the-mill models won’t cut it. CrossFit requires a special breed of jump rope, one that can go hard and fast and take a beating. In this article, we identify the 6 best jump ropes that are specifically for crossfitters. We’ll also provide an FAQ and a Buyer’s Guide so that you can be confident that your jump rope can keep up with you. The 321 Strong Aluminium Jump Rope rope got the jump on the competition with this being our favorite CrossFit jump rope. Here’s what we put them over the top. 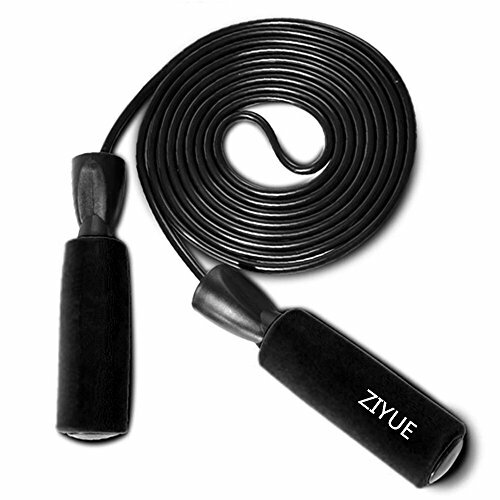 The 321 Strong jump rope has ergonomically designed tapered handles that provide a very natural, comfortable grip. This reduces tension on the wrists, forearms and handles to allow you to skip harder for longer. These handles are also longer than most. The 321 Strong rope features a tangle-free design. The spindle design is not only ideal for providing you a hassle free no tangle rope, but it is also great for doing double unders. The 321 Strong Jump Rope provides you with a braided steel wire rope that is encased in a PVC covering. This makes an extremely tough rope that can handle almost anything that it slams into, including concrete. It provides you with a smooth, natural revolution. The handle of the 321 Strong jump rope is fitted with high-quality ball bearings to provide you with a fast, easy spin of the rope. This CrossFit jump rope is completely adjustable so that you can just the right length for you. In fact, the 321 comes with a replacement rope for even more versatility. 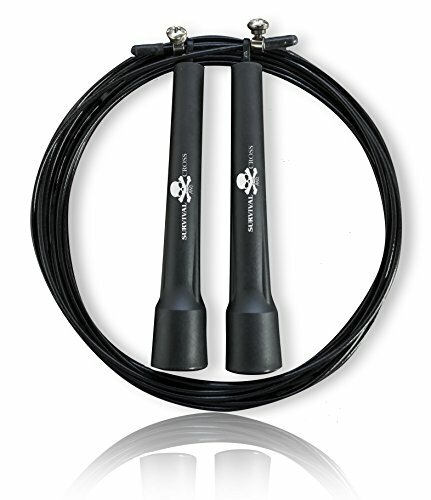 The Survival and Cross Jump Rope has a precision right angle external bearing design which makes it a lot faster than many of its competitors. That doesn’t mean however that beginners will be overwhelmed – you have total control over the speed of each revolution. The Survival and Cross jump rope has a very rugged PVC covered wire rope, giving you the confidence that if you accidentally slam it into the floor you won’t damage it (the floor may be another story). The Survival and Cross jump rope is a very well priced unit, being one of the most affordable high spec CrossFit ropes on the market. The Survival and Cross jump rope angle design limits the agility of this rope. Also, there is a screw on the rope connector that only allows for a single adjustment. That means that once the rope is cut and in place, you cannot adjust it a second time. Finally, the handles are not as strong as some of the competition. 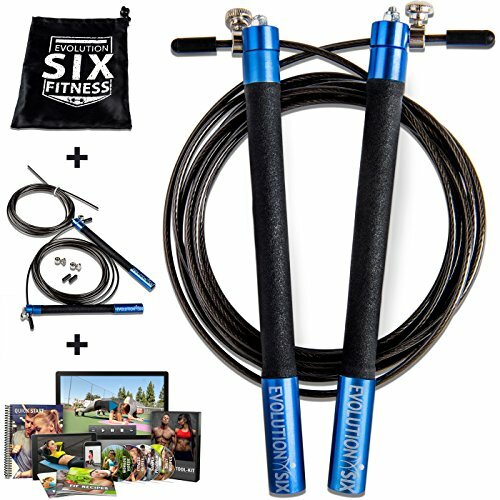 The Evolution Six Jump Rope comes as part of a complete package that includes online access to HD workout videos, recipes, sample fitness programs and exercise and workout challenges. You also get a spare rope cable and adjustment screw and a handy carry case. This rope is designed for speed. As a result, it is slim and lightweight and features high-quality ball bearings in the handles. This all results in a fast revolution but a very smooth, natural movement of the cable. The Evolution rope has a long thin aluminum handles that are covered in foam padding to give you that extra level of comfort and sweat protection. 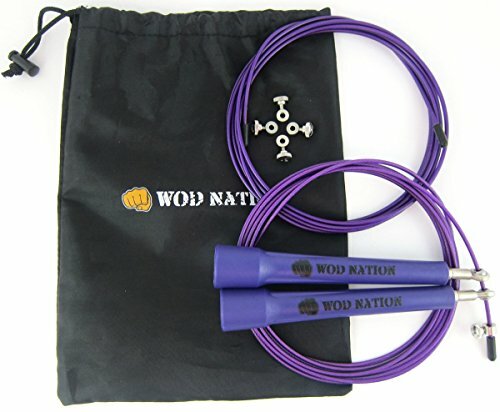 The WOD Nation Speed Rope is one of the fastest ropes that we have come across, thanks to its lightness and the high-end precision ball bearings that are enclosed within the handle. Keep in mind, however, that this rope is specifically designed for speed, so it is not great for more agility based work such as double unders. The WOD Nation Speed Rope is a competition level rope that will last the distance if used well. However, it is not really meant for beginners, so if you are constantly smacking it against the floor, it might show signs of wear. This rope comes with a spare cable to give you a back up if you need to customize the length. This is a cut adjust rope, so when each rope is cut to size there is no going back. The WOD Nation CrossFit speed rope handles are very smooth. This means that they will get sweaty and slippery, so you may want to put tape on them to provide a better hold. The BeMaxx Fitness Jump Rope provides you with ergonomic anti-slip handles to ensure that your hands don’t get fatigued while you are skipping. They also wick away sweat so that your hands won’t slip. 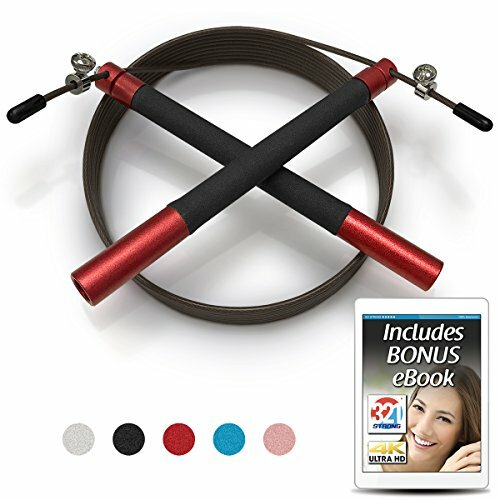 The BeMaxx Fitness Jump Rope features a 90-degree vertical ball bearing system that provides you with a very fast spin movement and an impressively smooth rotation. With this system, you are able to achieve a higher number of rotations per minute than with most other CrossFit speed ropes. 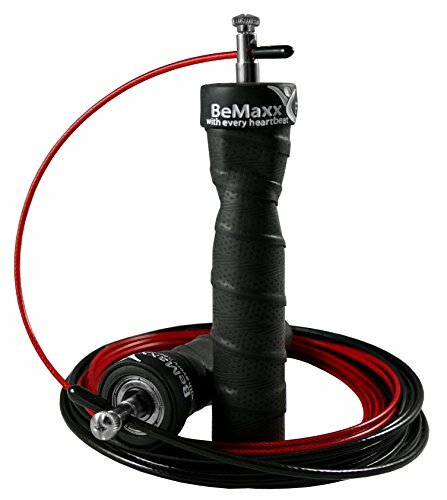 The BeMaxx speed rope comes with a spare cable and adjustment screw as well as a complete guide to jump rope that includes a 12-week starter challenge program. Jump Ropes may all pretty much look the same time, but, as with most things, the devil is in the details. The vast majority of CrossFit jump ropes will be constructed from a coated wire so there is little actual difference in the rope itself. But there is more to a jump rope than a rope. Here are the details found in the handles that you need to consider when making your buying decision. It is the ball bearings that are housed in the handle compartment that determine the smoothness of the spinning action. That is why you want the highest quality ball bearings in there. Higher quality ball bearings may put the price up, but the extra cost will be well worth it. The handle shape of your CrossFit jump rope will have a lot to do with how fast the handle spins. It will also determine how fatigued your forearms, wrists, and hands get during your CrossFit jump rope workout. Look for rope handles that have been ergonomically designed to fit the shape of your hands. You also don’t want the handles to slip, so handles that are knurled or that have a slip-resistant coating sprayed onto them are a bonus. CrossFit jump ropes are generally made from plastic or aluminum. Plastic ropes are cheaper but they are also weaker and more likely to become slippery with use. You should always go for aluminum over plastic. The key to getting a great CrossFit jump rope workout lies in getting the correct length of your rope. That means that the rope that you buy needs to be adjustable – if it’s not, forget it. But the type of adjustability is also important. You don’t want a rope that you have to unscrew and cut. There is no going back when you cut a rope, which means it can’t be used for people of different heights. You are much better off with a rope where the excess can be stored within the handle or, alternatively, a rope with sliding handles that can be moved along the rope. As a CrossFitter speed is obviously important. You want a rope that will allow you to jump as fast as possible. A lighter rope will usually be faster. You will also find that ropes that attach just outside of the handles will be faster. How can I determine the proper CrossFit jump rope length? Stand with the rope handles in your hands and the place the middle of the rope under one foot. If the rope is the right length for you, the handles will come up to your chest level. What is the basic jump rope technique? Hold the handles with a medium grip – not too hard and not too loose – with the rope coming out between your thumb and forefinger. If your grip is too tight, you’ll compromise speed and your forearms will give out before the rest of your body does. Do not clench the handles. Proper swing comes exclusively from wrist and forearm rotation. Start holding the handles, with the rope behind you at your heels. Swing the rope overhead by twisting the forearms and wrists. Let the rope come down in front of you and land at your feet. Practice until this movement comes naturally. Proper body positioning is crucial to effective jump roping. Here are the key points to nailing your skipping posture. o Stand upright and look straight ahead. o Place your feet shoulder width apart. o Place your weight slightly forward on the balls of your feet. o Maintain a slight knee bend. o Actively engage your core, keeping it tight at all times. Initiate your jump by leaning slightly forward with 80% of your weight on your forefoot. Keeping a stable trunk, and with knees slightly bent, simply flick your toes back to push the floor away from you. This will cause you to lift off the floor slightly, completing your jump. Keep your knees slightly bent as you absorb the landing. You should always be landing on the balls of your feet.